Transportation challenges in this part of the state will be especially difficult this winter, and that's not just a weather forecast. It's a certainty, even if the winter is not colder and wetter as predicted. In three weeks the U.S. Army Corps of Engineers will close for repairs the navigational locks at three Columbia River dams. Barge traffic from The Dalles upstream will be shut down for more than three months, 14 weeks in fact, about seven times longer than routine maintenance closures in the past. The reason? This maintenance isn't routine. The $50 million project includes replacement of massive lock gates at The Dalles, John Day and Lower Monumental dams. Although river commerce won't be affected west of The Dalles, Southwest Washington will be impacted by significant increases in truck and train traffic through the Gorge and beyond. Thousands more trucks are projected to move along the river -- on Interstate 84 and state Highway 14 -- instead of on the river as usual. Throw in a blizzard or two and a highway closure or two and the challenge of 2010-2011 will be magnified. This, though, is nothing about which to complain. The temporary pain (it might not seem too temporary, lasting well into March) will be worth the ultimate gain. Kristin Meira, a spokeswoman for the Pacific Northwest Waterways Association in Portland, was quoted in a recent Columbian story: "While it will be a short-term challenge for commerce in the Northwest, the long-term benefits will be tremendous as far as the reliability of the inland barging system." And that system is one of the pillars of the Northwest economy: 40 million tons of cargo worth $17 billion is transported each year on the Columbia River. In Clark County, the project that has been planned for more than a year has brought both bad and good news. Vancouver-based Tidewater Barge Co. has announced it will temporarily lay off about 200 employees during the closure of the locks. That's because most of the company's barges travel far beyond The Dalles. In fact, one of the three dams, the Lower Monumental Dam, is on the lower Snake River. The suspension of work couldn't come at a worse time for the Tidewater employees -- during the holidays -- but the project has been timed to best accommodate salmon runs. The good news here has been the construction contract at Vancouver-based Thompson Metal Fab. Inc., which completed the work a couple of weeks ago. 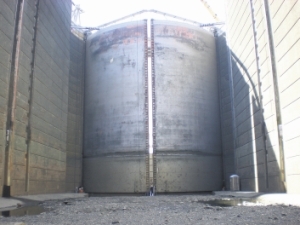 An $8 million, 750-ton gate system was built by the company and is being barged in three parts 254 miles to the Lower Monumental Dam, where it will be welded into one large gate. According to the Tri-City Herald, gasoline and diesel are being stockpiled at some places along the river, but it's uncertain how long the supply in those parked barges will last. To get some idea of the extra strain this project will place on highways, some of the four-barge tows can carry 134,000 tons of cargo, enough to fill more than 480 trucks. A lingering debate -- whether dams should be breached, particularly on the Snake River -- will be invigorated by this 14-week closure of dam locks. Supporters of the Columbia-Snake dams system say the temporary strains on transportation infrastructure will demonstrate the great value of that system. That's a compelling argument, and if Mother Nature gets nasty during the winter, their argument will become even more persuasive.